Breakfast tacos may very well be my favorite breakfast food of late. So much flavor wrapped up into one little easy-to-handle package. When the right ingredients are paired together, this is bliss on a platter. Beat the eggs in a large bowl. Set aside. Add chorizo to a large saucepan. Turn heat to medium-high, break up the chorizo into crumbles and saute until cooked through, approximately 10 minutes. Add the sliced mushrooms about 5 minutes into it. Keep stirring. While the chorizo is cooking, get the eggs going in a separate saucepan. Scramble them to your liking, adding salt and pepper to your taste. Meanwhile, have your kitchen assistant peel and slice the avocado into thin strips. When both the chorizo and eggs are finished cooking, heat the corn tortillas in the pan with a little splash of oil. 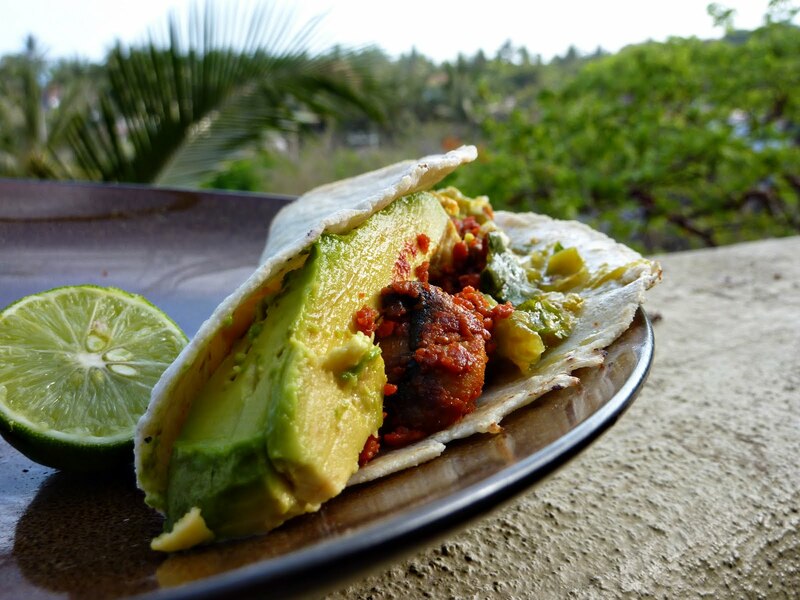 Layer eggs, chorizo, avocado and salsa in the tortilla and serve with a twist of lime over the top. Dude you can't just spend all this time posting and not say a word of how wonderful of time you are having!!!!! I have never been big on breakfast burritos (mainly because the ones at McDonalds terrify me), but these look incredible. One bite of limey avocadoy chorizoy eggy goodness and I would be done for!